Your very own framed photo of Steve Jobs. Is there a better alternative to Jobs shrine? Is Jobs shrine really the best app in System category? Will Jobs shrine work good on macOS 10.13.4? 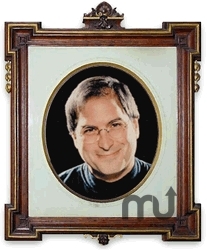 This basic widget displays a photo of Steve Jobs in an ornate frame. For use when you don't feel sufficiently within the Reality Distortion Field, or any time the sage and beaming visage could bring comfort. Jobs shrine needs a rating. Be the first to rate this app and get the discussion started!